‘Tis the season of goodwill! (Well, nearly). And that means that your donors are motivated to give, give, give – and we want to help you make the most of it. That’s why you’ll find six top tips to help you boost those charity donations and make sure that your fundraising efforts are working just as hard as you are – right here. Your donors are motivated by their emotions, but you knew that already, right? So how do you make sure you’re tuning in and playing on their emotions to boost your success and keep those charity donations rolling in? One way is by selling your entire story. Package up your history, your successes, the influence and impact you’ve had into one easy to digest, simple to read, beautifully bound Brochure. Give your donors (new and old) the chance to relive your story, from beginning to end. Choose high impact emotional imagery, real life anecdotes and be sure to include all the ways that they can get involved for maximum success. If you need a hand choosing your brochure, discover our range here. A handy branded donation form insert could also be key to triggering them to give – so make it as simple as possible! Don’t forget a hand written or hand signed Compliment Slip too. Direct mailers are the easy way to get your message straight into the hands of those that matter. With 70% of people claiming that they find direct mail more personal than email or the internet, and only around 25% of people opening emails that are from non-profit organisations, printing and mailing your message directly may be the key to keeping your donations rolling in. Plus, a huge 79% of all charity donations come from direct mail (stats from: https://www.bakergoodchild.co.uk/direct-mail-effective-fundraising-method-charities/), so can you afford to miss out? Choose your brochure type wisely. Saddle Stitched, Perfect Bound and Wiro Bound all offer their own unique style and feel, so have a think about what you’re including and the best application for your story. Package your postage well by adding branded Stickers, Address Labels or brand your own Printed Envelopes. Include a personalised cover letter, from your CEO. Your donors love to feel appreciated. Giving back could be a simple email, thanking them for their charity donations, a personal letter or even a goody bag at your next event. But whatever you choose, make sure that you make them feel appreciated – this way they’re more likely to give more frequently. Along with thanking your donors, make sure you follow up on event attendees and those who show interest in your charity. This could be key to turning them into regular donors. If you host an evet, try to get hold of your attendee’s email addresses or social media handles so you can send tailored messaging afterwards. If you’ve already got a mailing list, consider personalised follow ups to any emails you send, to really encourage collaboration and charity donations. Or, follow up with direct mail and personal letters for an extra touch. Donors love to feel special, and a hand signed note from your CEO, thanking them for attending an event or donating is an ideal way to keep your charity front of mind. If you’re hosting fundraising events, or perhaps you have your own stall at a fete, fair or expo, it’s vital to make sure you stand out from the crowd. This could be as simple as printing your own high impact Banners, Flags and Banner Stands to grab attention, or perhaps you think a little outside of the box and encourage people to visit in creative ways. Offering freebies on your stall like sweets and pens etc. If you’re not active on social media, you could be missing a trick. Not only does social media allow you a direct connection with your audience, it’s also a free way to get a feel for your audience and tap into their emotions and behavior. At your next event, consider creating a hashtag and get people sharing photos or stories of the day. Encourage followers by adding your handles to all of your printed promotions. Delve into the world of Instagram stories and Facebook Live videos to show your donors the human side of your brand. Ask the people that you’ve actively helped to share your story, host live interviews and post their photos and messages on your own account. Dedicate time into research and planning to ensure that you’re targeting your followers when they’re most receptive. Remember, not only can you collect Printed Points for every £1 you spend at Printed.com, customers can even donate their points to you. Think of it as another way of collecting charity donations – in printed form! You can use your points towards free print and essentials, making it even more affordable to get what you need. When you register with us as a charitable organisation, you’ll get 15% off each and every order you place with us, for life. Sign up with us by filling out the quick form here, using your registered charity information. Once we’ve verified your details, we’ll generate a unique voucher code and email it directly to you within two working days. You can then log in, choose your print and enter your code at the checkout to claim your 15% off. Are you a charity getting ready for your spring/summer events? Let us know how you’ll be making yours unmissable in the comments below. Don’t forget, commenting on our blog earns you 50 Printed Points too. 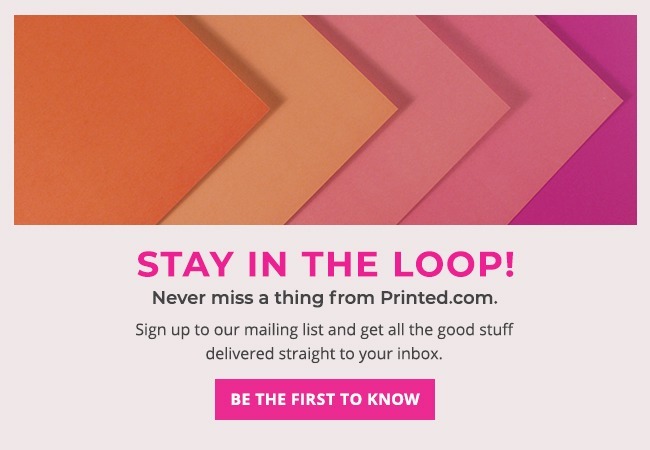 And to make sure you never miss a thing, and get up to date advice and tips for making the most of charity print, follow us on Twitter, Instagram and Facebook and don’t forget to check in on our blog regularly for loads more.